What breaks down barriers between colleagues better than stripping down to your birthday suit and taking a bath together? Well, nothing really. This week I had my first experience in an onsen (温泉), or a Japanese bathhouse. An onsen is one of two types of Japanese bathhouses, the other being a sentō (銭湯). Unless it is noted otherwise, you can assume that the water at a sentō is treated tap water. At an onsen, water is sourced from 温泉 (natural hot spring) or volcanic water from deep below the earth resulting in water that is naturally rich with minerals. After getting lost in the Tokyo metro (‘lost’ may be a dramatic word, my cell battery died and I had to…wait for it…use a paper map), getting locked out of my apartment after wandering around the city ALL day, and blistered feet, this trip was a MUCH NEEDED treat. I’m going to say this once, if you EVER have the opportunity to visit an onsen or sentō, do it. About 16 of the GAKKO team decided to make a late night visit to the Ooedo-Onsen-Monogatari (OOM). It amazes me that community bathing, as ancient a tradition it is, is still regularly practiced across one of the most technically advanced and developed countries in the world. An onsen visit is an enriched and enriching experience with a variety of customs and practiced traditions that guests are expected to participate in. changing room specifically for our underwear. Before you enter the bathhouse, you are able to meet your party (all genders) in a meeting or common room. Here, it was called the Hinomi Yagura. There is a bounty of food and drink and entertainment that you can partake of. Everyone is wearing their yakuta, and is barefoot. Little did everyone know, that we were also commando. Then, at one’s leisure, you enter the final changing room where you disrobe and remove your undergarments and retrieve two towels. One large towel joins your underwear in your third locker. The smaller will accompany you to the pools. The smaller one is not intended to get into the water, because as bathing suits, they are considered unsanitary and increase the risk of spreading disease. Nor are they to be used to cover your fine body. You’ve got to be ready to let it ALL hang out. The small towels are simply for the convenience of wiping your face dry in the pools. You can rest them on the top of your head, or set them neatly on the side of the pool. On the same topic of sanitation, before you enter the public pools, you’re required to bathe thoroughly with sudsy soap and water before entering. A series of seated showers and mirrors are made available for this. Tattoos are also not allowed and guests will actually be asked to leave. This is due to the Yazuka, (the Japanese mafia) who are typically marked by heavily tattooed bodies. A large bathhouse will have a variety of pools to choose from, varying in temperature, size, shape, depth, and material. Some may be indoors, outdoors or both. I first decided to sweat it out in the steam room. After which I plunged into a very cold pool. This didn’t last for much more than a second. I squealed,lost my small towel in the pool, jumped out and headed someplace warm. This called for laughs all around. The rest of the evening was followed by a free-spirited indulgence into each pool. Temperatures ranged from the ice bath described above, to almost too hot to submerge. The exterior ponds were accompanied by large rocks for lounging (like a mermaid). There were even small wooden tubs just large enough for two. 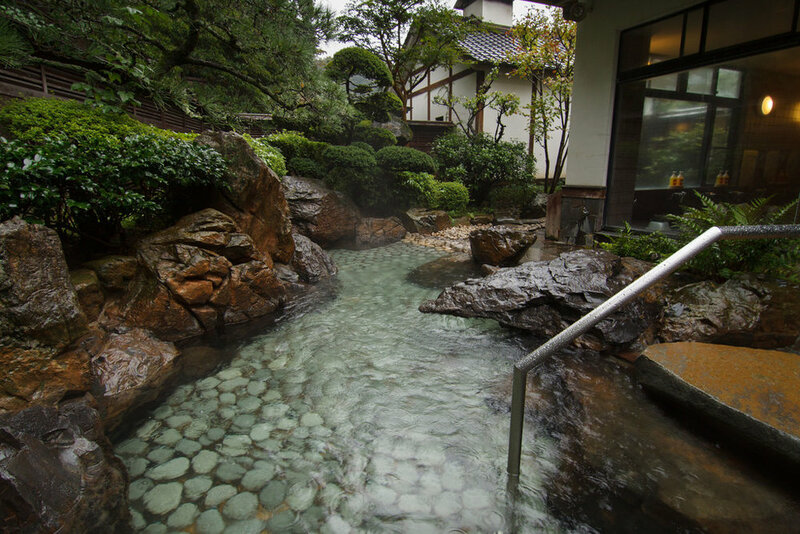 Many onsens also offer body massage, foot baths, salt beds and many other traditional Japanese body treatments. When the night finally came to a close at midnight (YES, this onsen is open all night) I entered the humid summer air with skin that felt smooth and tingly in the breeze. My body felt relaxed, rejuvenated, and alive. I finally climbed into bed at 2:30 and I've been dreaming about visiting an onsen again ever since.